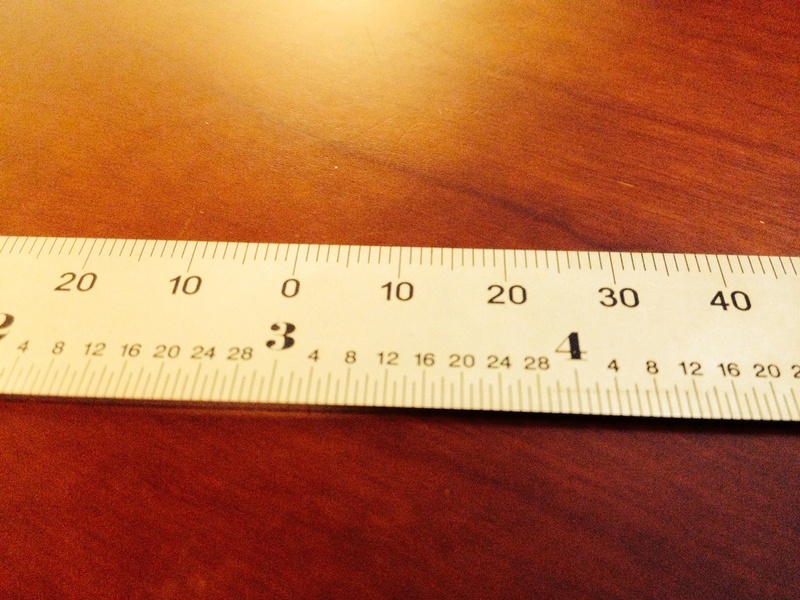 Finding My Six Inch Rule – Problem Solved! There are a few tools I use almost every time I’m in the shop working on a project. One of them is my Shinwa 6″ ruler. And it isn’t just something I need now that my emphasis is on hand tools; I used it just as frequently when setting up my table saw and routers. 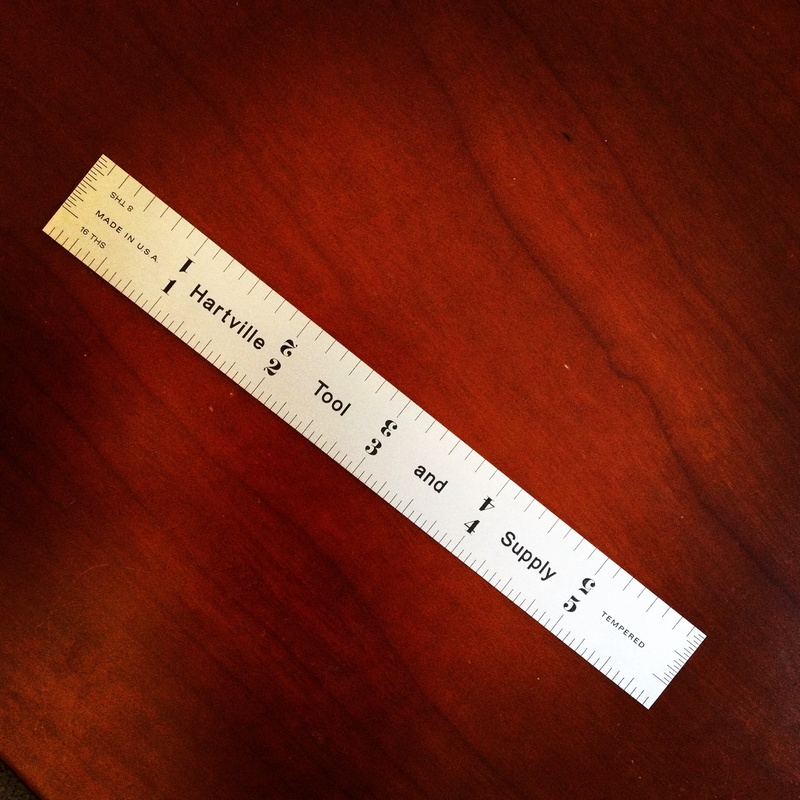 I picked this ruler up based on a tool comparison in one of the first issues of Woodworking Magazine. It has 1/8th” and 1/16″ graduations on one side and 1/32″ and 1/64″ graduations on the other. I’m not entirely sure how often I’ve used those last markings. It has 1/32″ graduations on the short edge, which I found useful for things like setting up table saw blade and router bit heights. The black markings are etched into the matte finished stainless steel, which makes it easy to read. Really, the only problem I have with it is that I seem to easily misplace it, especially when I’m not wearing my shop apron. It gets buried in shavings or covered with tools or I’ll set it down somewhere and can’t find it five minutes later when I need it again. Having two marking knives seems to help ensure I always have one handy when I need it; maybe I need to do something similar with 6″ rules. So earlier today, after another excellent meal at the Hartville Kitchen, I stopped over at Hartville Hardware to see if I could find another 6″ rule. I think I found one that fits the bill. 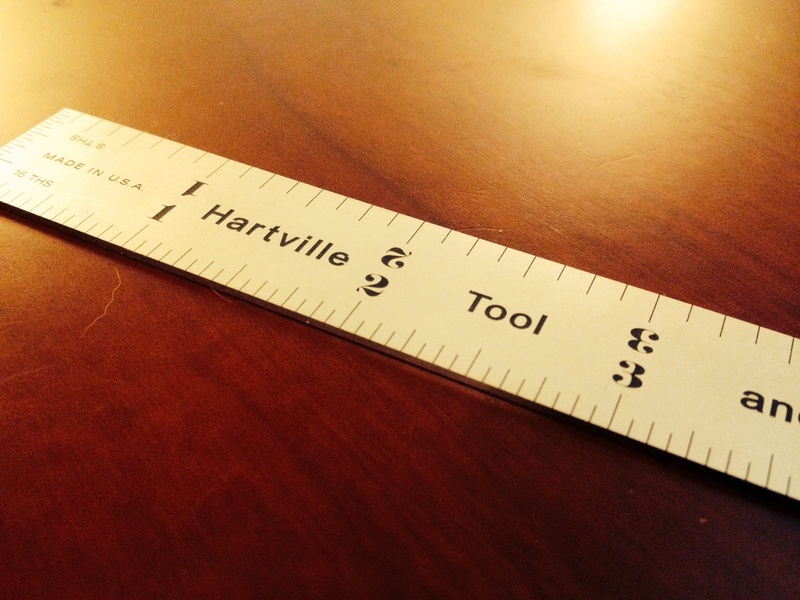 It is a Hartville Tool and Supply ruler that was marked as a centering rule. I could tell right away it was a quality product. For starters, the black etched markings show up very clearly on the matte finish. Just like the Shinwa, it has 1/32″ graduations on the short edges, 1/8″ and 1/16″ graduations on one side and 1/32″ graduations on the bottom half of the other side. I didn’t see how it was a center finding rule until I looked at the marks on the top half of the second side – they were metric (mm) graduations, laid out with zero in the center. I’m not exactly sure how useful that last bit will ever be, but… you never know. In any case, Hartville Hardware was having a bag sale – 20% off anything you can fit in a (not terribly large) paper sack – so it only cost me about $9 and I figured it was worth a try. As an added bonus, it’s made in the USA! I’ve just doubled my odds of finding my 6″ rule when I need it! Hmmm… or maybe I doubled my chances of losing it? I use my 6″ (Brown & Sharp, and two other no name ones) rule(s) for layout and I have never used the opposite side with 32nds and 64ths. What I would really like to find is a 6″ rule with 1/16ths on both edges of one side and 1/8ths on the opposite side the same way. I would gladly pony copious amounts of cash american for that.